Sterling Silver Wrap Amethyst Ring India Jewelry, "Her Majesty"
A wide band of hammered silver wraps in a dazzling cocktail ring of regal styling. Handcrafted by Aparna, the original design features a faceted oval amethyst, which represents February´s birthstone, that totals 5 carats. You can find amethyst wrap ring 'Her Majesty' by Aparna in jewelry categories such as Bollywood Rings, Birthstone Rings, Amethyst Rings, Silver Rings, Sterling Silver Rings, Wrap Rings and Single Stone Rings. Enjoy exploring these sections for other Novica treasures. "Her Majesty" Ring makes me feel that way, when I am wearing it. Thanks Aparna! Just got it today; would not be surprised if others take notice of it! 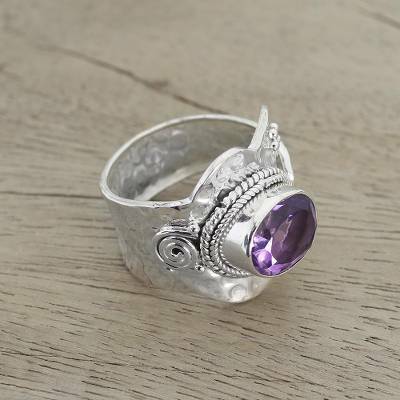 The Amethyst is so gorgeous; and it is surrounded by shiny (high polish I believe) sterling silver hammered design! "It's a Keeper". I wanted an amethyst and silver ring to wear on my index finger; this beautiful ring is perfect. The suggestions on sizing said to order a size up since the band is so wide, and I did, BUT it is too large. I bought some flexible ring sizers rather than go through the trouble of packing and returning the ring.